Here you will find detailed examples of a few pieces of work I have done, and collaborated on. 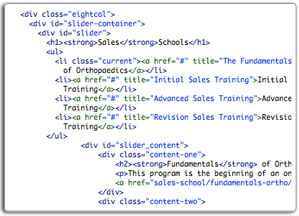 Each website has a stated objective, design, development, and programming notes. If you are interested in learning more about what I can do for you or your company, I will be more than happy to meet with you. 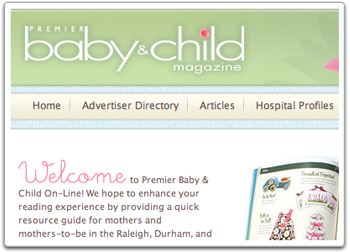 PremierBaby.com was initially created as a companion site to Premier Baby & Child Magazine in 2003. It consisted solely as a mirror of the magazine and included links to advertisers in the magazine. 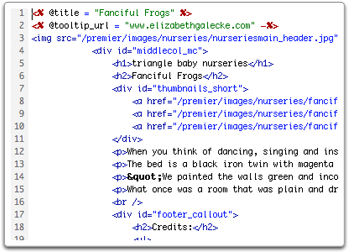 In 2007, a new site was designed and developed to offer more content to readers of the magazine, including new articles, resources and links, and photo galleries of parties, showers, and nurseries from previous issues. Users consist mainly of new mothers, and mothers-to-be. A monthly e-newsletter is also offered to site users, by subscription. A target goal of the redesign included a cleaner user interface that expanded and contracted naturally, paired with a modern, updated feel rivaling that of major, like-minded websites. Special care was taken to make sure all colors that were used in the "shell" would easily accommodate all graphics and photos, updated on a yearly basis, after the newest magazine hit the stands. The site was created in a CSS-driven environment, utilizing a “tableless” structure and built within a Ruby on Rails application. Web standards and SEO were taken into consideration while coding this medium-sized site. Worked closely with a production assistant who helped ensure pages flowed well and the site was user-friendly and intuitive. 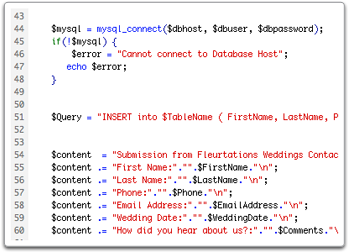 The Ruby on Rails programming for PremierBaby.com was structured in such a way to allow easy integration of data for the front-end developer, while still maintaining the integrity of the programming logic. 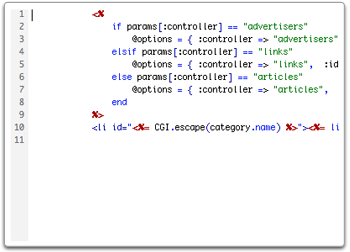 Code components could be added to the site, similarly to a dynamic include file, that would allow the site to grow along with the front-end production. Having knowledge of the site's overall goals and a clean HTML structure, the application developer and I worked closely to develop a good separation of logic and layout. 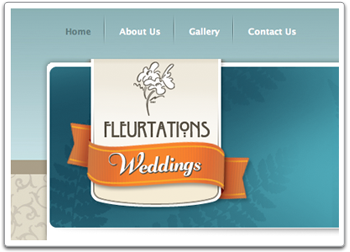 FleurtationsWeddings.com was created primarily as an off-shoot to Fleurtations Florist & Gifts in order to focus on the wedding and event-planning side of the business. The client was interested in showcasing his unique talents as a floral and tablescape designer to brides-to-be and other clientele interested in planning an event. 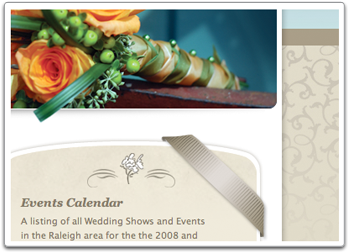 Since the site is specific to weddings and wedding design, the client needed the ability to show his creations ranging from single bouquets, tablescapes, and full weddings and parties in a photo gallery. Special care was taken in the design elements found throughout the site to give the overall feel of the wedding experience, such as is found in the ribbon surrounding the right box, as one might find on a placecard or wedding invitation. 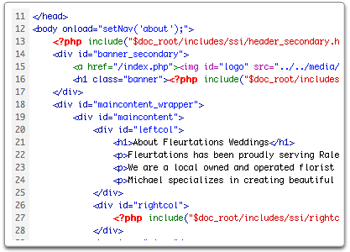 The site was created in a CSS-driven environment, utilizing a “tableless” structure and adhering to the most current XHTML web standards. 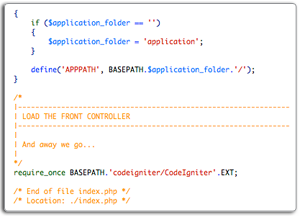 Typical coding obstacles were already overcome in the design phase of the project, allowing time to focus on creating clean and concise code. 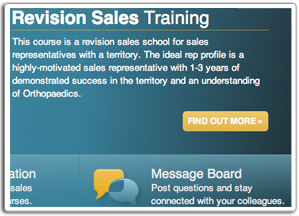 StrykerUniversity.com is a password protected site for Stryker Orthopaedics sales representatives. The main objective of the site is to educate the sales force on all current products and surgical procedures, in order to better sell to orthopaedic surgeons and hospitals. The site needed to be clean, easily updatable by non-web personnel, and easy to navigate for new hires as well as seasoned employees. The target goal of the design was to present a clean, modern feel, while still maintaining the Stryker ‘brand’. 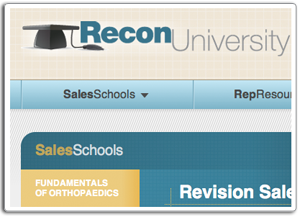 The design needed to be fluid and “color-coded” for each specific school — Recon University, Trauma University, and Joint Preservation University — and maintain the same look-and-feel so users would know they were still in the University, but in a specific school. The requirements for this site was to easily be viewable by a mobile device such as an iPad or smart phone. 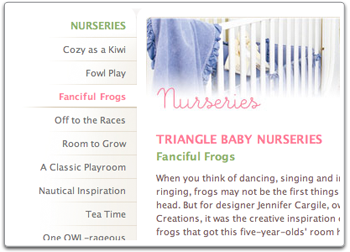 So the site needed to be built in HTML5 using a CSS3 framework for easy scalability. The site also needed to be encoded for viewing in Internet Explorer 7 & 8, primarily because Stryker itself is a .NET company, so all employees are expected to use Microsoft products for their personal computers.